Why is it customary to read the Book of Jonah on Yom Kippur? Did the whale really swallow Jonah or is it only an allegory? What is the secret of how to atone for our actions and block all the arrows of hatred directed toward Israel? Rav Laitman’s guide for the perplexed for Yom Kippur. Have you ever stopped to ask yourself why you fast on Yom Kippur; why you go to the synagogue on Yom Kippur; why you ask a friend or someone you have wronged to forgive you? We have been used to keeping these customs since our childhood, and it seems the main reason for that is that we all want to be found innocent, at least to some degree, on Yom Kippur. Those who have the means even compete with the sum of money to pay for the right to read the Book of Jonah in public, a well-known merit for wealth and success in business in the coming year. The sums go up from year to year, but do they understand what they are paying for? The story of the prophet Jonah begins with a mission he receives from God; he is to warn the gentiles, the people of Nineveh, to repent their evil way, from unfounded hatred to love of others. Just like in the past, just like Jonah, so do we, the people of Israel today have a role that we cannot avoid. The same role that accompanies us since the time of ancient Babylon when Abraham united us into a nation on the basis of love of others—to establish among us the unity that will serve as an example for the whole world. Fulfilling this role is our right to exist. We have experienced how this law operates throughout our history: when we are united, we prosper and the world prospers too. When we fall into unfounded hatred, we receive blows and the world deteriorates. With time we have failed to build the connection between us to such extent that we don’t believe we can re-establish the good relations between us again. We are repulsed by hearing that our role is to be a Light unto the nations of the world. We have forgotten our role and when we escape from it the storm arrives…. Jonah escapes his mission, boards a ship and sails overseas. His escape generates a storm, and the sailors realize that the reason for their suffering is the Jew who is onboard their ship. Throwing him overboard into the sea soon follows. In today’s global world, the nations of the world also blame us for every crisis there is. The fate of the nation of Israel is unavoidable. The sailors in the story change each time, but our fate is the same. If we don’t awaken from our deep sleep and agree to fulfill our mission, the time will come when we are thrown into the sea is sure to come. Jonah was thrown into the sea and swallowed by a whale. At the end of his self-examination, he agrees to fulfill the mission he was given, and only then does the fish bring him to a safe shore, to Nineveh. Like Jonah, we carry within us a method to connect. This is the national genome that binds us into one nation and we cannot escape it. When we connect, we will serve as an example of unity for all the nations. The only question is whether we will be responsible enough or whether, God forbid, we will be thrown into the depths of the ocean so that we will agree to fulfill our destiny. Our role is to turn the unfounded hatred into love of each other, yet instead of being a Light unto the nations, we do everything in our power to be like all the other nations. But the steamroller of development makes more and more people and nations subconsciously feel that the Jews are responsible for all their troubles, and so the nations will not change their attitude toward us for the better until we discharge our duty. The purpose of Yom Kippur is to allow us to do some deep introspection, and it is an opportunity for us to take on our mission and come to the decision to connect and be Light unto the nations of the world. Only then will the global turmoil around us quiet down and all of humanity will live in peace, and a Sukkah of peace will be spread over all of us. A good New Year and may all of Israel be signed and sealed in the Book of Life! But your eyes, which have seen all the great work of the Lord, which He did. The method of correction that a person masters is both universal and personal; there is no difference between this and that. Each one must go through the entire history from beginning to end and to be in the image of Adam, Noah, Abraham, and all other so-called characters. In fact they are spiritual degrees, spiritual images of each of us. We all must dress in them and move forward. In this way the whole Torah is gradually imprinted in us from the first day of creation to the last day of the existence of the entire system, until this system will become unified and global where the most recent souls will merge with all previous already corrected ones, and then the construction of one single soul called Adam will be completed. Each of us has to go through this chain of transformations within oneself; this is why it is said that you, your children, and your grandchildren will go through these states. Answer: The fact is that the previous states are called fathers and future states are called sons, and in all of them a person must still come to spiritual revelation, every time taking on new commitments, new corrections, and advancement toward the goal. Hence, when it is said that “you are the ones who have seen,” it refers to the degree at which you are now. A person while in a certain state, from this state can only understand things that relate to him. Therefore, the Torah each time addresses each one exactly on his level. Question: Does it mean that it is a mistake to think that there is God above who is watching our actions and from whom we need to ask for forgiveness? Answer: A person goes through various stages of development. Therefore, it is impossible to say that some of his beliefs are correct and some aren’t. He thinks this way today, but gradually he corrects his perception, rising in knowledge and feeling. And then, of course the concept of “I and the Creator” changes completely. I feel more and more that the upper force is the result of my connection with other people and doesn’t exist outside of it. Only the essence of the Creator (Atzmuto) that is absolutely inaccessible to me exists independently. Therefore, we must firmly grasp that the Creator exists only in the connection with people. There can be no appeal to the Creator except from our unity; after all, we create the place for His revelation through it. Then each one must judge himself: how much he is connected with others? This is his entire redemption. It is impossible to judge a person individually. This is an immense mistake that we always make instinctively: thinking about ourselves, counting on ourselves, and acting alone. This is a fatal mistake that we have continued to make for thousands of years. The separation from the Creator is the reason for our terrible forgetfulness. Comment: Regrettably, it sounds very relevant, because separation, disagreement, and hostility between various currents and factions. Answer: The people of Israel already went through such states during the destruction of the First and Second Temples. Jews were killing each other then, not only with words, but also with real weapons, shedding brotherly blood in the civil wars. I hope very much that today we won’t come to that. We haven’t taken out our swords yet, but we earnestly fight with each other by all other means. This is because we have forgotten who we are, what the foundation of our nation is, and our responsibility to move toward unity; although, in fact, this is our own correction and the correction of the entire world. In the News (The Guardian): “Significant numbers of under 30s lack self-confidence and are at risk of mental health problems, with women worst affected, says report. “Despair, worries about the future and financial pressures are taking a toll on millions of young Britons, according to a poll which found young women in particular were suffering. “Low pay and lack of work in today’s Britain are resulting in “suspended adulthood”, with many living or moving back in with their parents and putting off having children, according to the poll of thousands of 18 to 30-year-olds. “Young women are being particularly affected. The percentage of women reporting that they lacked self-confidence was 54%, compared with 39% of young men. “While four in 10 young people said they felt worn down, the percentage for young women was 46% compared with 38% of men. One in three said they were worried about their mental health, including 38% of young women and 29% of young men. “Dr Carole Easton, the chief executive of Young Women’s Trust, which supports and represents women aged 16 to 30 struggling to live on low or no pay in England and Wales, said it was distressing that so many young people were struggling at a time of life traditionally characterised by youthful confidence. My Comment: The quality of life will not improve unless we start working on the explanation of the need to unite people in a common society in the likeness of nature. Then we will begin to awaken the positive effect on society and see the positive outcome in the young generation. Question: It is not by chance that the human level is called “speaking” in Kabbalah, since speech is what distinguishes humans from animals. We can talk, express our desires and thoughts. However, it turns out that animals, and especially monkeys, also have their own language. How is it different from human language? Answer: Animals have their own languages within the framework required for their lives. They don’t feel any need for anything more. Animal language passes between each other all the information relevant for their lives, existence, and the maintenance of relationships between them. Whereas for the people, the most important thing is to convey information to each other about our development. This is why human language must be very rich and complemented by pictures, drawings, writing, all sorts of characters, singing, and the transfer of information through written letters and other types of memory. Our development obligates us to this. An animal is attached to the current moment in which it presently lives. A human, however, feels the connection with the past and the future, and therefore he requires some kind of addition to his memory that will help him store the information and pass it on from one generation to another and within a few generations. This is the only way he can advance. Although this is not the most important thing in a human. We haven’t yet touched the main difference between a human and an animal, which is his special and high destiny. So far we are discussing only things that distinguish us from animals in this material life: language, culture, education, building human society and government with all its systems. All this was developed by people and organized naturally, and it is present in different cultures: in South America, China, Africa, and Oceania. But the special destiny of human is reaching the human level that is called Adam (Man). This is not an animal that is just a little more developed. All human life that raises him above the animal level is to know the source of his life, its cause and purpose. These are the questions that separate man from any animal, including the chimpanzee. A monkey doesn’t ask itself about the meaning of its life and therefore it doesn’t develop. And the human does, and this question forces him to create religions, beliefs, contact with the hidden forces, to look for something that exists outside of this world, life on the other planets, and to think what will happen to him after death. A person is extremely concerned with these questions. That is, he is not attached to the current moment only, to this physical, material life. On the contrary, he is ready to dedicate his entire life to find out with whom he is really connected. Who is he? Who controls and obligates him? What is he living for? What is this program that constantly pushes him to develop and makes him ask about the purpose of life and its meaning? This part of a person develops more and more and demands an answer. 70% of the Europe’s Jews will not celebrate the coming holiday season together because of the fear of anti-Semitism. “Our nation is used to being persecuted, the excuse for hating us changes, but it is the same tune over and over again.” Rav Laitman explains the law of anti-Semitism, why it repeats in every generation, and how we can avoid the next wave of hatred. 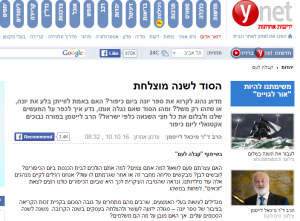 The wave of terrorism raised its head again last week in Israel and reawakened the preparedness and the tension again. But the fear doesn’t permeate only Israel but also our fellow Jews in Europe. 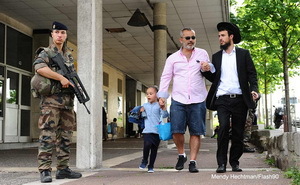 According to a new troubling survey conducted by the European Jewish Association and the Rabbinical Center of Europe 70% of the European Jews are afraid of coming to the public prayers and celebrations on Rosh HaShana and Yom Kippur because of the rise in anti-Semitic incidents, despite the increased security measures and policing around Jewish institutions. “The challenge has doubled during the last months” says the union CEO, “we are also coping with the increased harassment of Jews by Muslims and a significant increase of power of extreme right-wing movements. Europe is used to signaling out the Jews. It is the stronghold of the BDS movement, which operates against Israel, and incitement campaigns like “Israeli Apartheid week” are launched in European capital cities, and tens of thousands of anti-Semitic statements are published daily online accusing the Jews of all the evil in the world. With the rate things are happening, it would not be surprising if soon a new international committee were appointed with the “initiative to formulate a strategy to impose peace in the Middle East,” that would conclude that the solution to Europe’s problems is the de-legitimization of Israel. They may suddenly decide that the operative solution to the refugee crisis in Europe is to resettle them by our side in the land of Israel, the country they themselves assigned in the UN Partition Plan in November 1947. Don’t let politics fool you. What is happening in Europe now is merely a new external expression of the recurring pattern of hatred that has been part of our history for ages. Unfortunately history teaches us that the anti-Semites have won this struggle as attested by the millions of Jews who have been murdered inspired by blood libels since 1144 to the present. Today the main expression of anti-Semitism is anti-Israel, “modern blood libel” under the guise of anti-Zionism. Why don’t rational explanations about the situation in the Middle East convince any intellectual? Why will we never be able to escape our identity? Why will the hatred of Israel continue to raise its head just as it has for ages? Why is it that unlike any other nation in history, the more they try to destroy us, they will not be able to complete the job? According to Kabbalah, anti-Semitism is not a passing phenomenon but a law of nature that can be measured. When we unite over all the disputes and disagreements, the positive force that can do wonders spreads in the world. On the other hand, when we are divided and emotionally distant from each other, we invoke the negative force in the world, which returns and hits us with a burst of anti-Semitism. The irrational hatred arising then as it is now reminds us the hard way that we have a role, and although we would be glad to be rid of it, it is impossible. Even if we assimilate or try to hide our Israeli identity, we will always remain Jews. We are a nation that carries an idea, a social ideal of love of man, of our nation and of the world. We became a nation on the basis altruism expressed by the rule “Love thy neighbor as thyself,” and only the return to love can defeat the hatred the world feels toward us. Kabbalists tell us that we Jews decide the fate of the world. “Just as the organs of a body cannot exist even for one moment without the heart,” as it is written in The Book of Zohar,” neither can the nations of the world exist without Israel.” Through the unity between us, we oblige the world to unite and the abundance begins to flow. While we are divided, we separate them and this clogs the pipes of abundance and leads to wars and hatred. Baal HaSulam, Rabbi Yehuda Ashlag, the great 20th century Kabbalist wrote that “the nation of Israel was installed with a transmitter, and to the degree that Israel are connected, they transmit their power to the other nations of the world.” He also wrote, “We are the sons of the ideal,” and only when we fulfill it and unite will we be able to live in peace. The pressure that can be put on us by Europe and through it by all the nations of the world may take us back to the years in which we wandered from one place to another, at best, or to our destruction just like 80 years ago, at worst. Although it may seem that the Jewish people have a home in the land of Israel today, “The whole Zionistic ideas will be annulled,” wrote Baal HaSulam in “The Last Generation.” With great sadness he describes the process of the decline of our future if we don’t fulfill our role and transmit the force of connection to the world through us. “This state will be very poor and its inhabitants will suffer greatly and many of them or their children will undoubtedly gradually leave the country and only a negligible number will be left, who will also eventually assimilate among the Arabs.” Then there will truly be nowhere to run. In times of crisis, no country, not even the US, will support us or receive us. It was the same in the days of Nazi Germany when the Jews who felt threatened by anti-Semitism tried to escape fearing the great disaster that was approaching. Some even sailed the infamous St. Louis to the South America, but when they reached Cuba the government told them that they were not welcome and refused to receive them. They sailed to the US where they were refused again, and having no choice they returned to Europe and most of them were killed in the Holocaust. Baal HaSulam, who knew the law of anti-Semitism and all the laws of nature that operate in our reality, warned people that the Holocaust was approaching, “I have already published most of my views in 1933. I have also spoken to the leaders of the generation, and my words were not accepted then. Although I screamed and warned that the world was going to be destroyed, it did not impress, but now after the nuclear and the hydrogen bomb I believe that the world will believe that the end of the world is very near and that Israel will be the first to get burnt, just the way it was in the previous war. Therefore it is the right thing to awaken the world today so that they will receive the only remedy there is and will live and survive” (“The Last Generation”). The loud cry of Baal HaSulam is still echoing today and is more relevant than ever before. Even then, when Europe was prosperous, the Jews preferred to complacently dance to the tune of a waltz in Berlin or tranquilly chew schnitzel despite the great impending danger. The waves of modern anti-Semitism washing Europe today should serve as reminder of our role: to unite and to be light unto the nations of the world, to be an example of the corrected society in which everyone lives in brotherly love above all our differences. Today we are also nearing the fatal choice, and just as we did when we became a nation for the first time at the gathering at Mt. Sinai and were faced with a similar decision, when placed before us was an unequivocal choice: to unite or here will be our burial place, mutual guarantee or unfounded hate, all or nothing. We made a huge effort, conquered the mount of hatred between us, and connected as one man in one heart. If we connect as one bundle, we will harness anti-Semitism to our advantage. Since “the main protector against calamity is love and unity, when Israel feel love, unity, and brotherhood toward one another, there is no room for disaster to affect them (Maor VaShemesh). Question: How is it possible to learn to differentiate between a state in which I have truly risen above the ego and the usual happy feeling of fulfillment within the ego? How do I not deceive myself? Answer: It is possible to distinguish this only within the group, not in any other place. You need to nullify yourself in relation toward others, seeing yourself higher or lower than them, communicating with each other on specific channels. You should do the groundwork within the group of Ten in such a way that everyone will be equal and interconnected so the network that we weave among us will become like the characteristics of the Creator, with mutual bestowal and love between us. Then to the degree that there is equivalence of form with Him, the Light will be revealed in it.